I’m back from Grafton! It was such a wonderful week! Full of laughs, loads of information, a class full of wonderful women, warm weather, new friendships, fantastic mosaics… Canberra is cold and blustery and frankly I didn’t want to come back. I’d be happy to hang out in Newcastle for a while longer! Still, I am back and with lots of enthusiasm and energy – I’ve added so much more to my mosaic to do list. I’m going to start sketching out some ideas for a bathroom floor installation. For now, I can’t wait to get stuck into this mural. This workshop gets back to basics. It is content rich full of information and advice. Students will finish the week with a strong foundation in mosaic technique. We will discuss which substrates are right for any given project, how to prep a substrate for its intended purpose, which adhesive to use under differing circumstances and also how to source materials. 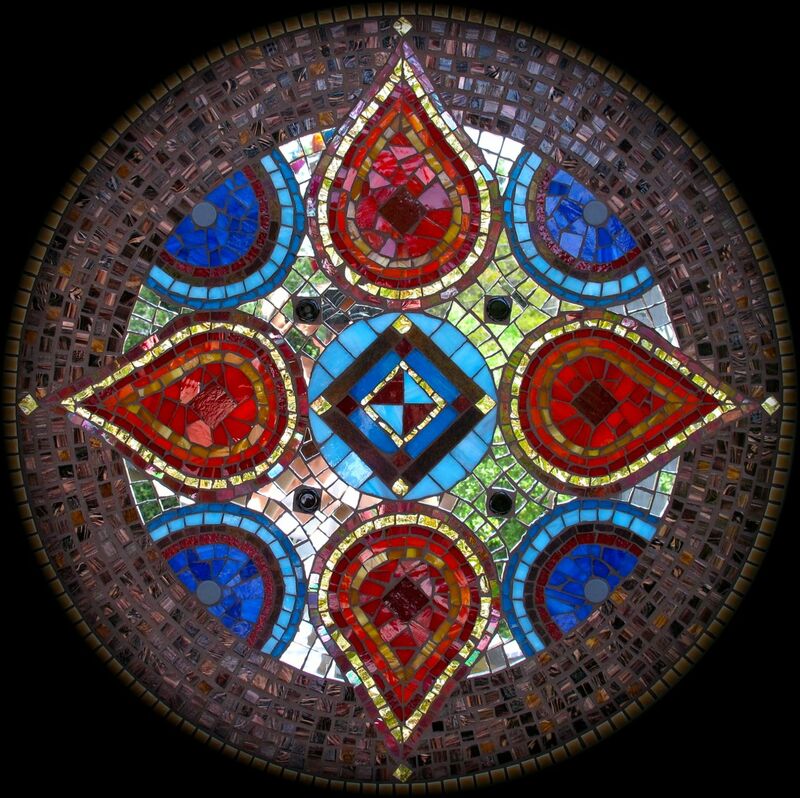 We will look at mosaic design basics, andamento, colour, cutting techniques, and how to get the most out of your tools. Grouting and how this can completely change the vibe of a mosaic will also be explored. 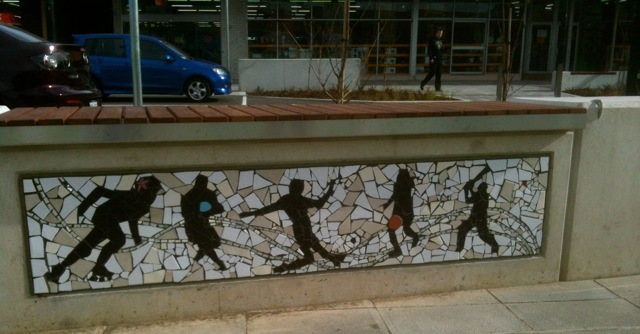 Students will create several mosaics using different techniques: direct, indirect using mesh, reverse indirect, tempered glass, glass on glass and the groutless method of mosaic. Each student is encouraged to create a mosaic using all the techniques listed however time-wise it may not be possible for everyone to do so, as we all work at different rates. 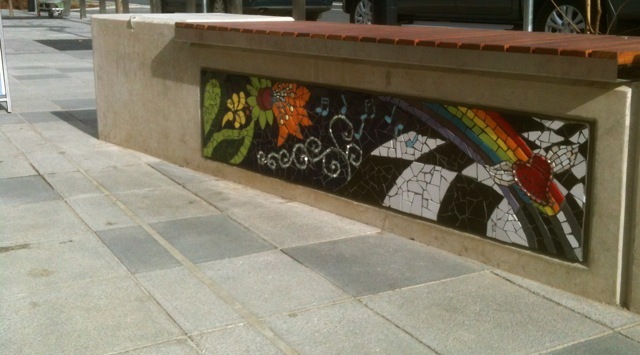 Students are then encouraged to create at least two mosaics in the technique that interests them most. We will work primarily with a myriad of different glass for each project. These include but are not limited to stained glass, vitreous glass, mirror, millefiori, glass gems, glass rods, and ceramic, marble. I’ve uploaded more pics of the week to my facebook page as I can’t fit them all here, so feel free to take a look there. I also managed to get a small piece done while up North. I’ve called it Tappeto II. I’ll make a third soon and the three Tappetos will go into the showroom of a tile shop here in Canberra – so long as they like them I guess! I went shooting the other day with an old friend and started collecting all the bullet casings… Will have to get him to start collecting them for me! Now that I’ve mostly unpacked, I have to repack and get ready for the Children’s workshop in Sydney next week. 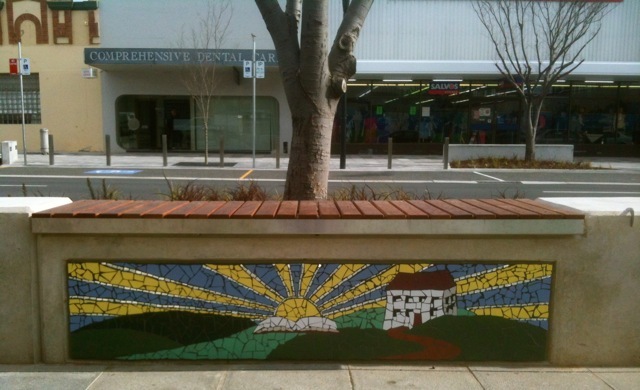 I’m excited to say that earlier this year I released some new mosaic workshops that will take place here in Canberra. One of which will be my first Visiting Artist, Marian Shapiro. 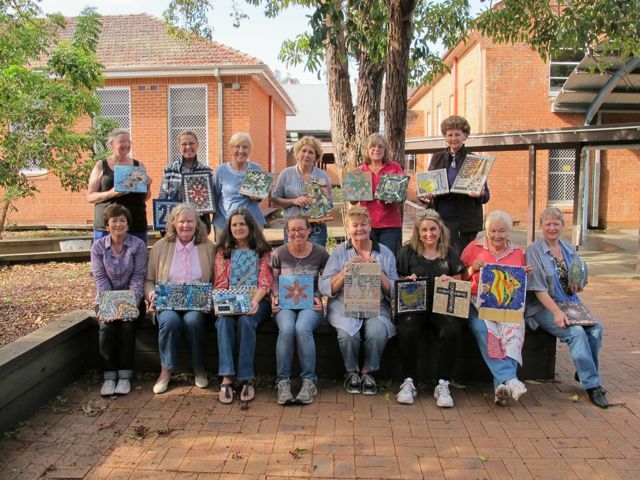 Marian will be heading down from Sydney on November 19 to teach a one-day workshop on creating 3D substrates for mosaic. All substrates are suitable for exterior use. Health and safety issues are discussed and a slideshow of inspiration pieces will accompany the lecture portion of the workshop. No experience necessary and beginners welcome. Full course notes and resource lists are provided. Super exciting to be able to have that level of control over your own substrate, but also to have that creative freedom! Marian is an award winning artist, well known in the mosaic world and we’re lucky to have her on these fine shores. Places are limited and registrations are made online via Eventzilla or through my website (which will redirect you to the Eventzilla page). Email me if you have any questions! Another class I’m happy to be offering is a class that spans over six weeks on a Monday morning. I’ve called it Mosaic 301: Journey into Mosaics as this is exactly what we will do. It is essentially an extension of Mosaic 101 and Mosaic 201 whilst also venturing into other techniques such as tempered glass and making mosaics on mesh, as well as using a variety of materials. 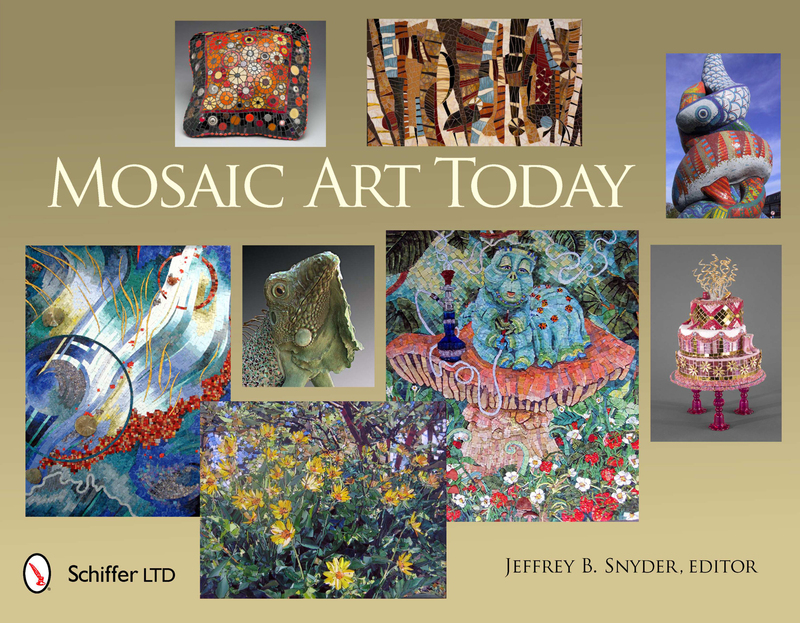 Over the six weeks, students will learn how to create a mosaic from start to finish. We will meet once a week for three hours and create two pieces, one for interior use and another suitable for exterior use, grouting both on the last day. The interior mosaic will be made using glass while the exterior mosaic will be created with ceramic on mesh. We will discuss how to prep the substrate, appropriate selection of materials, adhesives, safety, tile setting, design basics & terminology. A list of resources is available in the handouts provided. 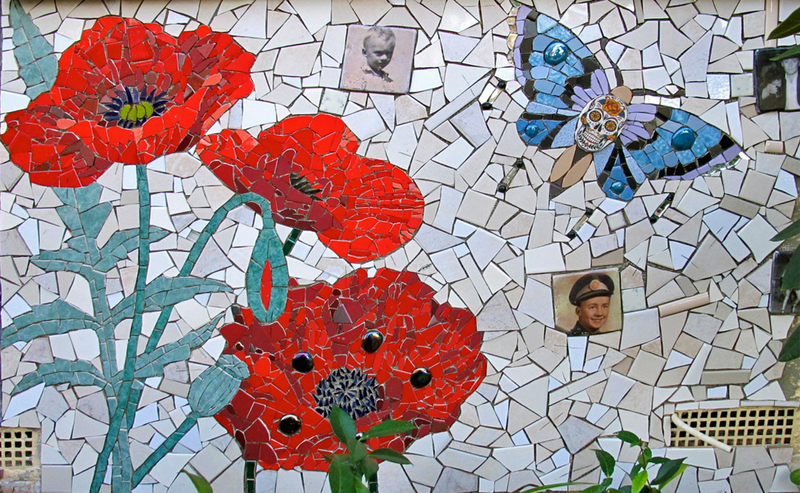 This class is suitable for the beginner as well as those with some mosaic experience who would like to extend their knowledge of making mosaics. Students will gain a strong foundation in this versatile medium. 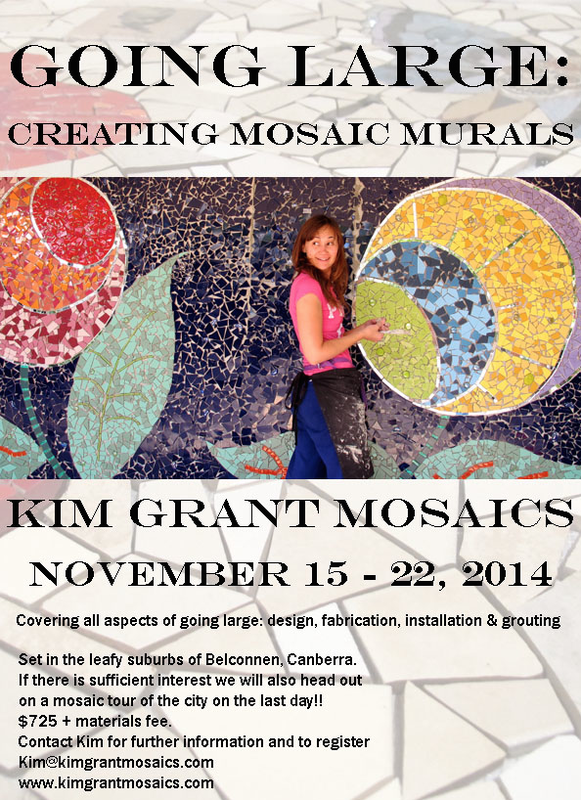 No art or mosaic experience necessary! I also finally managed to get some sample boards made up for my classes to show how opus and grout can completely change the vibe of the same mosaic. Come join a class – there are many on offer! !